Máximo Díaz de Quijano returned from America with a great wealth and in 1883 entrusted Gaudí to build a summer house in Comillas, near Sobrellano Palace. Antoni Gaudí was 31 years old. He had just accepted the order of La Sagrada Família and was full of optimism, poetry and love for life. 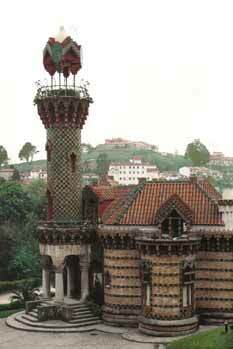 Probably because of this, Gaudí found prodigious solutions for El Capricho (The Caprice, in English). Díaz de Quijano was an amateur musician; for this reason we think that the name of El Capricho for a building signifies the same as we use in music for designating pieces that do not follow the rules and with variations of pace according to a personal caprice. Gaudí was clearly inspired in the Pier Station project (1876) that he had done in University, with the difference that in El Capricho there is only one tower instead of two. Also, in many of its elements it presents similarities to the Vicens House, which Gaudí was constructing simultaneously in Gràcia, close to Barcelona, between 1883 and 1888.
udí’s generation. The main room is the lounge. It is the whole height of the building and has sash windows. When the windows are opened or closed, it can be heard a music produced by tubular bells, each one with a different tone, which are moved by counterweights. Everything is a work of the capricious poet Gaudí, like the caissoned ceilings of Mudejar inspiration, the applications of ceramics and the small chimneys. The set of stairs that lead to the basement and the spiral staircase that leads to the tower are very well designed, showing Gaudí's great skill with connecting different levels, which he learned studying the Dictionnarie de l’architecture française du XIe au XVIe siècle (1854-68) by Viollet-le-Duc. 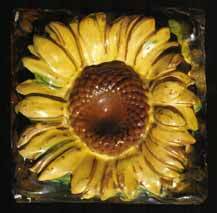 Outside, Gaudí mixes stone, brick and glazed ceramics, which motif is the flower and leaves of a sunflower, producing an agreeable combination with the intense green of the landscape of Comillas. The original rooves, today missing and disfigured, were made of glazed ceramics. The chimneys that finish off the roves were also completely original. The tower is the element most distinguished of El Capricho, all covereded in ceramics with the sunflower, the same ones that Gaudí used in the terrace of Vicens House. It ends in a terrace similar to that of the warehouse of El Garraf and a small building supported by four columns of cast iron, with a graceful rail. Díaz de Quijano and Gaudí did not manage to meet personally. Gaudí never visited Comillas. He entrusted the execution of the works to his friend and companion of promotion Cristòfor Cascante i Colom. Both were assistants of Joan Martorell; and from 1882 Cascante had established himself in Comillas to direct the works of Sobrellano Palace and of the Seminar, projected by Martorell. Cascante had a very detailed model and planes from Gaudí, to whom he consulted all his doubts by letter.